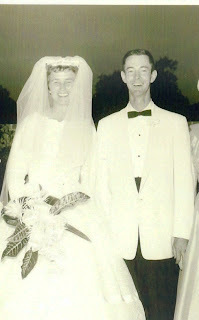 Last Friday was my parents' official 50th wedding anniversary. The true festivities will have to wait until we can all be gathered in December, but we didn't want the day to come and go without saying anything. The logistics can be complicated when there are seven children living all over the country from California to Kentucky, but remedied with a "can do" attitude from our eldest brother and a little help from modern technology, we arranged to have a surprise conference call. As customary with my family, we instantly partook in a fast food version of a humor feast. Incidentally, my family is hysterical. We are far from perfect, but even over miles and miles of fiber optic network we managed to connect in a way that fed a part of me that I didn’t even know was hungry. And don’t get me wrong, it’s not because I don’t lead a completely happy and charmed existence. I love my life. But the boundary between what feels like two different lives became rather clear after hanging up on our family conference call. Gone are the days of lying on our green shag carpet in front of the fan on a hot day while my mother made dinner and my dad helped with homework. Neatly packaged in my first life are memories of early morning swim outings and frozen yogurt runs with my sister Lori, dates and Congressional internships with my sister Suzi, mock weddings behind the garage performed by my brother Randy (I had to “marry” his friend Mark Marean – he was not a good kisser in 2nd grade, just in case you were wondering), dressing up to serve dinner to my brothers and their dates on the 2nd floor balcony, and the daily comedy routine by Greg, performing uncanny imitations of our high school staff. Gone are the days when I didn’t have to worry, because Mom and Dad had things under control. It seems crazy to me that there are now people in my life that look to me the same way I look to my parents. I am stunned at the thought of young, vulnerable little souls counting on me for answers and guidance. Most of the time we do okay, but 50 years later we all still rely on my parents’ faith, knowledge, example, and unconditional love to get us through tough spots. How ridiculously lucky we are. Happy Anniversary Mom and Dad. Thanks for setting the bar so high. Shout “hooray” or “holy crap”? It is customary in our community to post fliers for upcoming events or lost animals near the neighborhood mailboxes. At the beginning of the summer last year I posted my first-ever announcement; I can’t remember exactly how I worded it but I remember the bold-type across the top to get people’s attention that something of mine was definitely LOST. Those who took the time to read the rest would learn that the item I was missing was my sanity, a tragedy brought on by the new summer schedule of no alone time, frequent bickering, and nonstop statements declaring a Code Red of “I’m bored.” One of my neighbors, while innocently picking up her energy bills and Linens ‘N Things coupons, discovered the flier and recognized the work as likely coming from me. We laughed about it, commiserated a little, and then went on with our summer of frolicking in tall grass and sipping cold drinks by the poolside. Or I may have just spent it locked in my room playing Kenny G trying to prevent myself from curling up in the fetal position. Or maybe it was the Kenny G that put me in the fetal position. Whatever. Anyway, I haven’t posted any fliers lately but last Saturday morning I realized that I was about one dirty cereal bowl left on the kitchen table away from going postal. Instead, I announced to my one and only while bestowing a quick kiss that I was leaving. “Are you coming back?” he slowly asked while maintaining a grin. “Eventually,” I said. I drove across town to a Borders bookstore, ordered a soda and planted myself in a big, soft chair by a guy wearing headphones. I took my magazine out and laid it on my lap, not yet ready to commit to reading and momentarily content to observe the others around me. The guy on my left was on his computer, and when he got up to cross the room I spotted the dog picture on his screensaver. I envisioned him spending Sunday afternoons walking his dog in trendy parks chock-full of hot babes also walking their pets and wondered if that was how he met girls. I took a long sip of my drink and opened my magazine, ready to distract myself with fashions I will never live up to and advice I will probably never follow. I was minimally distracted with an article about financial choices when I noticed a couple sitting across from another gentleman at a table near me – they weren’t trying very hard to be quiet and so I listened in. It took all of 8 seconds to understand the purpose of this meeting: an engaged couple meeting with their DJ to discuss the music for their upcoming Big Day. I kept my magazine open and looked at it in mock interest, making a conscious decision to listen to their conversation instead. The bride’s parents are divorced, her dad is remarried to one who is apparently “lucky to be getting a corsage”, her mother is anti-marriage, and her dad supports an alcoholic lifestyle. She doesn’t want the Father/Daughter dance to be too sappy. The groom’s dad tries to save people from inebriating beverages and apparently thinks his son is already going to hell. The parent’s dance is deemed as too awkward and therefore eliminated. They can’t decide on the song to play to transition to “Party Time” so the DJ starts singing snippets from Run DMC, Aerosmith, and Justin Timberlake to give them choices. The groom wants to know if the money dance is too cheesy, after which the DJ offers an alternative of an “Advice Dance”, where the guests dancing with the Bride and Groom offer advice for marriage. For example, if I were a friend of this couple and were invited to this reception and I danced with the groom, I might say something like, “If you'd spent as much time with a premarital counselor as you did with your DJ, you’d be off to a good start.” Plus I might suggest trying to distract the bride’s parents from this portion of the program. I spent about three hours at Borders on Saturday, mostly eavesdropping on strangers. By the time I left the DJ was talking about his crazy non-law-abiding citizen friend from high school who later became a reverend. He wondered if they had done a background check on him before adorning him in the cloth. Whatever, I was tired of planning this couple’s wedding and I was ready to go home. There’s nothing like hearing a middle-aged DJ singing “Crazy Love” in the middle of a Borders to snap you out of a summer funk. Samantha had to go to the doctor to receive the rest of her shots that would bring her up to date before school starts. I know that immunizations have been successful in preventing thousands of people from needless suffering, but I am starting to get irritated with the fact that at every well-child-check I am informed of two or three more shots that have been added to the repertoire of disease prevention. In order to follow protocol I am inevitably handed a piece of paper where in small print it details the worst case scenarios of death occurring only in very rare instances. Even still, I have agreed to all additional shots up to this point in my children's lives. Whipping out the chart at the office it is revealed that Samantha will need four shots - two boosters, a tetanus, and a Tdap. "And," the doctor began, "there's a new vaccine that has become available for children of this age that you should be aware of called the HPV vaccine. It stands for human papilloma virus (wait a minute, isn't that...) which is a sexually transmitted disease (holy crap, he's not kidding) which would prevent a sexually active (sexually active? she's wearing a puppy shirt!) girl from getting infected." "Uh..." I eloquently began, "I'm not too worried about that at this point." He went on to explain that while abstinence is the advocated form of birth control and disease prevention in their office, confessing that he and his wife were virgins when THEY got married, it was still something I should be aware of. I looked at Samantha sitting wide-eyed on the patient table and turned back to the Doctor, "Uh, no thanks. I think we're good." More accurately, I think SHE'S good. I might need some valium very soon. “Alohamora!” Drew shouted this Harry Potter spell at me as I sat at the computer this morning, checking my email. “Hey Mom. Wingardium leviosa!” he commanded, waving his wand with authority. He has the full Harry Potter costume now, and has been wearing it every day lately. He sleeps in it. Yesterday he wore the full bit to the grocery store. The glasses, the cloak – he’s even rummaged through Cory’s tie collection to find a suitable replica to wear with his white church shirt so as to give the full effect. It’s like church every day here now. Except the cloak isn’t normally standard issue. Nor are the glasses. And I can’t recall the last time a magic induced spell was shouted in the chapel…. “Expecto patronum!” He chanted while circling around my chair. “Expecto patronum? What does that do?” I asked. 1. Will I have good skin in heaven? 2. Have you ever had an allover back hickey? See: "chinese cupping massage". Let's just say if Mick Jagger ever made out with my back I think I know what it would look like the next day. 4. Is there a statute of limitations on the number of days that it's appropriate for two large tents to be set up in your neighbor's backyard that their eight kids share with their rabbit and three dogs? Just curious. Seems like a week should be long enough. 5. If I actually beat my 7-year-old at a computer game should I do the happy dance around the house or just play it cool? 6. Is it a sign of food addiction if I walked out of "Ratatouille" craving a delicious meal? All I really wanted to do was change my website to make it a little more original – a little less “Oh, she has the same template as mine!” and a little more “Oohh…I like her style.” Having mastered a 486 computer in college and Microsoft Word, Excel, and PowerPoint in my earlier professional life, surely it couldn’t be that hard to personalize my blog template? Within minutes of trying, I had erased my “About Me” summary and changed the language of my blog to Russian. Funny, I don’t actually speak or read Russian, so it took me a while to fix that. But once I did, I tried to outsmart the system by creating a bogus blog site to practice my changes on – but then it outsmarted ME by linking it to my other site. In the process of trying to delete it, all sorts of warnings and instructions tried to help me through it. But I don’t understand most of what the computer assumes that I know. For example, what is an RSS Feed? In my world, that’s what Relief Society Sisters do when somebody is sick. What does that have to do with my blog? And what are widgets? And why is my server threatening to delete them all? And why do I fear this might have serious repercussions for the Land of Oz? I have this vague recollection of being a child and my mother taking us to the local health center for shots. I recall being in what felt like a never ending line that circled the building, slowly inching up to our fate of our dose for disease prevention. I heard children's cries the whole way, each one starting out loud from the initial violation, gradually slowing and calming to the sound of their mothers' soothing voices. As a child in line that day I vividly remember how it made me feel to hear the cries coming from the inside of that building, as if I was headed for Purgatory itself. Now as a parent I understand that sometimes, even when it hurts, certain things really are for your own good. Unfortunately, that doesn't seem to make it any easier. Yesterday was Drew's 3rd ear surgery in a year. I know that he will be better off if we can, once and for all, repair all of the problems that we have been trying to fix. So that maybe one day he can pick a seat in his classroom next to a friend instead of having to sit in a certain spot to be able to hear better; maybe one year he can start school without any "NO RECESS" Post-It note warnings next to his name; maybe one day soon he can go swimming or venture out into the rain, feeling free to lift his head up and stick out his tongue to catch a few drops instead of running for cover with his sweatshirt pulled up and over as a protective shield. Maybe one day he won't have to worry so much. Sometimes it feels like the line is endless, and I am listening to those excruciating cries as we inch our way up. Only instead of me at the end of this line I will ultimately hand over my son. They will put him out under the premise of fun and smiley faces and "What flavor would you like in your mask?" and "Did you see the hot air balloon pictures on the ceiling?" But I know, and so does he, what happens when he wakes up. Unlike the fleeting pain of shots, he will wake up and be inconsolable. My words will attempt love and comfort but they will sound loud and annoying. My touch will attempt to calm but instead will irritate. We will offer popsicles and slushies only to be met with cries, because saying "yes" requires a decision and saying "no" is like admitting defeat, and because a measly little popsicle in a cup feels about as helpful as dumping a glass of water on a forest fire. I want to carress, whisper, distract and love him back into lucidity, but such efforts get rejected when my son is coming out of his drug-induced stupor. I've heard it said that when you have a child on drugs, you can't reason with them because you're not talking to your child, you're talking to the drug. While in this case it is temporary, I think I know what that feels like. Only time will tell whether this surgery was successful. I keep telling Drew that all of it is for his own good, as we patiently (?) wait for the evidence that would make it true. "For your own good" has its own set of consequences, but I remain confident that one day, one day, it will come. One of the great things about having slightly older kids is that I don’t have to wake up when they do. It’s a fantastic benefit, particularly in the summer when we have nowhere to be before at least 9am. So instead of waking to an alarm, I am usually roused by a child in my face checking to see if I am actually still alive, an argument between two youngsters who have decided to start the day off right, or by giggling from two youngsters who have turned boredom into a game. But today I came out of my coma somewhat gradually by a recurring beeping sound. Unlike the alarm by my bed, it seemed to be originating from further away. I woke up just enough to rule out any kind of emergency and fell back asleep. I heard it again, and fell back asleep. I heard it a good 38 more times before Drew came up to my room, only to order me away from the downstairs and closed my bedroom door. Minutes later I heard the clomping sound of rushing feet ascending the stairs and arriving at my bedside. I opened my eyes to discover Samantha and Drew, standing there, smiling big and seeming very proud of themselves. “What’s this you guys?” I hoisted myself to a sitting position as they handed me a tray of freshly cooked french toast and a glass of milk. “It’s breakfast in bed! !” They replied. “Wow, you guys are awesome – what’s the occasion?” I asked. “No reason,” they said. Samantha turned and left the room, and Drew stayed long enough to watch me take a bite, content to watch the happiness that he helped create. I hugged him before he left; Samantha returned a few minutes later where she also collected a hug and retrieved my dishes.